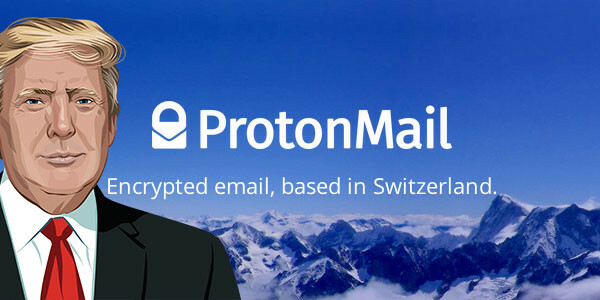 ProtonMail one of the biggest providers of encrypted mail service to world Switzerland based cooperation. Andy Yen, co-founder of ProtonMail reported that after the win of Donald Trump the user count increased 100%. That means the double of before. "Since Trump's victory, the number of new users coming to ProtonMail has doubled compared to the previous week. Many of our new users have voiced a few common concerns both on Twitter and also in emails to us. Given Trump's campaign rhetoric against journalists, political enemies, immigrants, and Muslims, there is concern that Trump could use the new tools at his disposal to target certain groups. As the NSA currently operates completely out of the public eye with very little legal oversight, all of this could be done in secret." Andy Yen, co-founder of ProtonMail. ProtonMail noticed also the change of the balance on user number who has political view. "ProtonMail users have always come from both the left and right side of the political spectrum. Today, we are seeing an influx of liberal users, but ProtonMail has also long been popular with the political right, who were truly worried about big government spying, and the Obama administration having access to their communications. Now the tables have turned." So, as we see the election had an impact on division of people in USA but also that has effect on companies also. Like last week’s blame on Facebook and this happened after. Are private emails a threat for government? How the Scammers Getting Your Email Addresses? Did Facebook helped Donald Trump to win? Security for your emails and accounts!